Ever wonder how easy to make these chocolate truffles? How delicious they taste? How wonderful it would be when presenting or receiving these lovely treats? These truffles are downright easy to make, only three ingredients mixing together, absolutely fool proof without failure. They are absolutely tasty because I used my most favourite chocolate, Lindt. I am not receiving any of them, yet I made them for fun and share them with the chocolate lovers around. “Melt her heart with Lindor this Valentine’s Day” on Lindt’s really got me thinking of making their truffles and share the melting love around. Happy Valentine's Day to you all ! Makes approximately 20 milk, 20 dark and 20 white truffles. Heat the cream until it just comes to a boil, add the chopped chocolate and remove pan from heat. 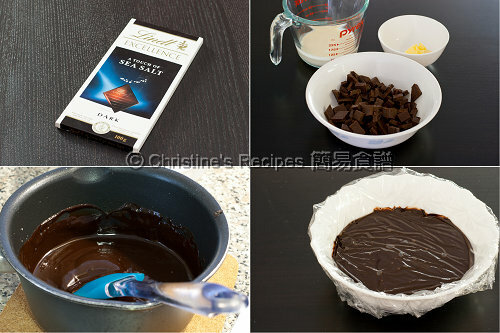 Stir or whisk until the chocolate is completely melted. Only for milk or dark truffles: Stir in the butter until the ganache is smooth. Put in a bowl and cover with plastic wrap ensuring that the plastic makes contact with the entire surface of the ganache. Refrigerate over night or until the ganache is set. Use a melon baller, small ice cream scoop or teaspoon (I used two teaspoons and fingers). Roll the ganache in a ball and place on parchment paper. 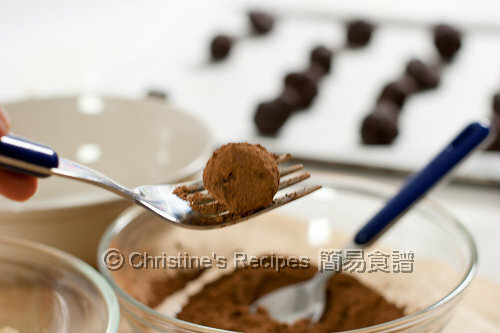 Roll finished truffles in unsweetened cocoa powder (see “Finishing the truffles” for decorating tips). Because of their high fat content, truffles will melt in your hands when you are rolling them. Make sure you work quickly and don’t over roll. Use your finger tips and when washing your hands rinse them with cold water. You may also roll the truffles using cocoa powder to coat your hands. This will, however, only allow you to use one finish on the truffle (i.e. cocoa powder rather than chopped nuts or enrobing them in melted chocolate). 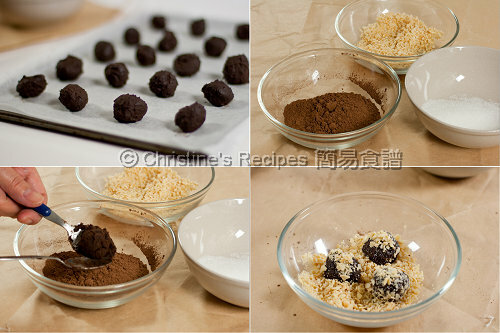 Finishing the truffles can be as simple as rolling them in cocoa powder or powdered sugar. You can also roll them in the following: chocolate shavings, chopped chocolate, chopped toasted nuts: walnuts, pistachios, almonds, hazelnuts, coconut. After hand-rolling the truffles, place them on a shallow tray filled with the desired coating. Roll the truffle in the coating with either a pair of spoons or your hands. Hey, I'm the first to taste your truffles. Lovely pictures too! Btw I've posted a Biscotti recipe today and have mentioned your recipe too. Have a great day! These look so pretty, delicious and fun to make. I have never made. Only love to eat. Must try this. Have a wonderful Valentine's Day! Very very lovely! I want to make these too, since my kids eat Ferrero Rocher like they are free. LOL. These are so elegant looking. I also love the little paper cups that you used - they just add to them. I would like to make some truffles, my husband would love them. I love the rich, chocolaty taste of truffles! Yours turned out beautifully and I love those little wrappers! Love this easy recipe for truffles. Perfect for Valentine's Day, Christine. Just three ingredients? It is really easy :) ...I shall try making these when the "mood" gets in. I've seen tim-tam ones... I'm just dying to eat one now... sigh..
Wow! It really looks great. They are very cute and pretty, so perfect for V Day! yummy truffles! never tried making these before but seems easy from here, thanks for sharing this! hope you had a great valentines day! 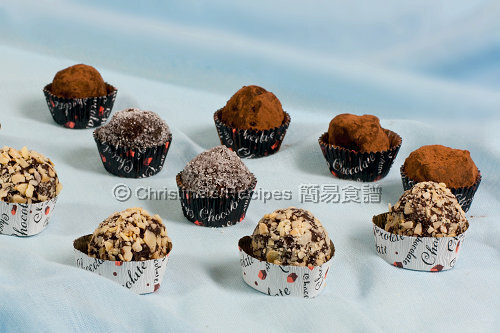 This will be the next truffle recipe I make since you used Lindt. I love Lindt and these look great! I love truffles! They are easy but...am lazy =P so many little steps involved. Christine, what is heavy cream? Heavy cream is a kind of whipping cream, contains about 36% fat and makes dessert creamier. Hi Christine, would you please explain the difference between whipping cream and fresh cream? When to apply them? Whipping cream is a kind of fresh cream. You can beat it to make or serve dessert or make savoury dishes. is it ok to use cadbury milk choc? and, what type of Lindt dark choc do u use? 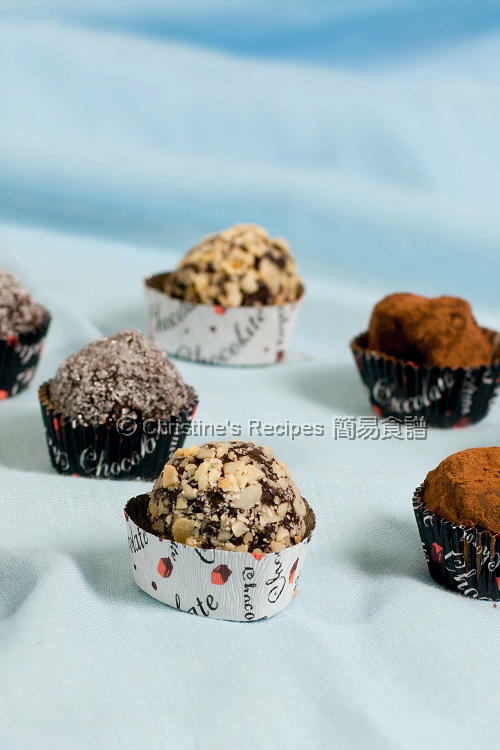 Milk choc has got milk and sugar already, not quite suitable for making these truffles. Try to get those for cooking. To make gingerbread truffles: Add allspice, cloves, nutmeg, cinnamon. DELICIOUS! BETTER than Godiva - AS RICH AS Lindsor/Lindt truffles!